The University of Florida essay prompt is a requirement you cannot skip if you want to be admitted to your dream course. It can be difficult to accomplish especially if the question centers on a personal experience that is best answered in a narrative essay. Look at the different ways that you can make your UF essay stand out and you’ll be the best in writing a good personal statement. My idea of the good life might be a little similar to those of others who have been brought up, as I have, under the guidance of a hard working, ethical family who want the best for themselves and those around them. My conception of a the good life is a life where my place of work is somewhere I enjoy going to rather than fear; somewhere I excel in rather than endure. The good life is one where I have no debt, where I own a nice house and car with the woman of my dreams in a location of our dreams. The good life is a life where we have financial security, can afford 1-2 vacations a year, and where we are able to treat those close to us, grow a family of our own and provide a healthy lifestyle for them so that, one day, they, too, can conceive of – and enjoy – their own good life. It goes without saying that the University of Florida is widely known for offering students a better chance than most to attain their good life. With a remarkable 150 research centres and consistently high ratings, it sounds to me like there are simply no better academic surroundings in the US that would offer me the kind of framework to head out there post-education and achieve my ideal conception of the good life. Moreover, I’m well aware that almost two-thirds of your students graduate without any student loan debt, whilst close to 100% could be classed as above-average students and many graduates go onto get an extremely high salary return for their tuition fees. This suggests to me that the most highly prized and ambitious students go to University of Florida, and it is my firm belief that working alongside the very best students rubs off on others, myself included, thereby promoting a rewarding, highly academic and, in short, brilliant atmosphere. 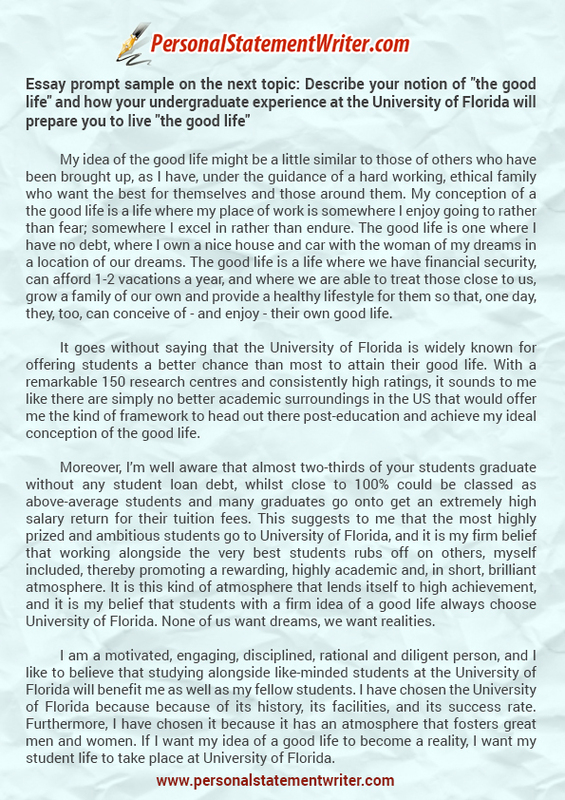 It is this kind of atmosphere that lends itself to high achievement, and it is my belief that students with a firm idea of a good life always choose University of Florida. None of us want dreams, we want realities. I am a motivated, engaging, disciplined, rational and diligent person, and I like to believe that studying alongside like-minded students at the University of Florida will benefit me as well as my fellow students. I have chosen the University of Florida because because of its history, its facilities, and its success rate. Furthermore, I have chosen it because it has an atmosphere that fosters great men and women. If I want my idea of a good life to become a reality, I want my student life to take place at University of Florida. Avoid being intimidated. The best way to conquer this is to be positive about your own experiences and defining qualities. Create a list of experiences where you used these qualities to your advantage and put it into your Pepperdine law mission statement. It does not always have to be an out of the ordinary story. Simple or daily experiences also make good stories especially when these display your skills and capabilities. Talk about a problem. Compelling stories involve a problem where you get to discuss how you passed or resolved it. It is not just a means of grabbing attention, but also to show your strength and potentials as a prospective student. Storytelling by anecdote. Once you have a story or experience to share, you can write it in a form of anecdote where you begin in the peak of the action. You can already use this as an introduction written in one or two paragraphs. Setting the scene and using descriptive language. 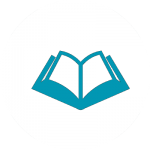 Take your readers back to the moment through the descriptions. Describe how you felt, what you heard or smelled. Background and conclusion. The background story should tell the committee about what caused the problem or event. Continue on how you handled or resolved it and what lessons you learned. Link this to your character, personality and defining qualities. Then, discuss how you plan to use these to achieve your plans and goals. If the problem still seems difficult for you, the best way is to seek professional UF personal statement writing help. 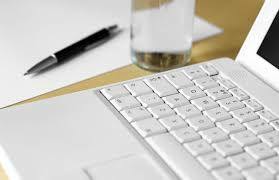 There are skilled writers who can deliver the output in a timely manner while providing their services within your budget. Already have your statement but not sure that it’s the best it can be? Our UF personal statement review service is here for you! Have the benefit of affordable yet creative University of Florida or Temple University essay prompt by letting pro writers help! Use the University of Florida essay prompt and create a winning essay yourself!